Curtains in fashion colors and prints. Simple panels with optional valances. Linen/cotton drape, lined with cotton sateen. Featuring interlinked octagon pattern. Construction: 4" rod pocket, 2" header/back tabs. Fan-print linen/cotton drape, lined with cotton sateen. Construction: 4" rod pocket, 2" header/back tabs. Tile-print linen/cotton drape, lined with cotton sateen. Construction: 4" rod pocket, 2" header/back tabs. Chinese garden jacquard curtain. Face, linen. Lining, polyester/cotton. Floral curtain panel. Face, cotton/linen. Lining, polyester/cotton. Rod pocket and back hang tags. Pair of curtain panel. Packed in plastic resealable bag. 5" rod pocket and back hang tags. Made of cotton. Curtains made of cotton. Lined. Contrasting tiebacks included. Red and ivory "French Country" curtains include buffalo-check tiebacks. Made in the USA of imported cotton by Pacific Coast Home Furnishings. Pair of cotton curtains. 52"W x 96"L each. Cotton toile reverses to silk checks. Tie-top style. Made of cotton. Taffeta pinch-pleat and rod-pocket curtains from Eastern Accents. Available in an array of colors Curtain panel with rod pocket. Polyester. Handmade, cut and sewn to order curtain panel. Rod pocket. Drapery lining included. Weighted corners. Medium-weight cotton with Greek key detail. Lined. Pinch-pleat curtains with Greek key trim. Lined and weighted. Ombré curtain panel. Patterned curtain panel with beaded trim on edge. Three finger pinch pleat header. Curtain panel with leaf diamond pattern. Three finger pinch pleat header. Curtain panel with sequin wave pattern. Shimmer curtain panel. Panels have a return and overlap of 3.5". Three-finger pinch pleat header. Curtain panel in marbleized pattern. Handmade curtain panel. Drapery lining included. Rod pocket. Weighted corners. Handmade pinch pleat curtain panel. Drapery lining included. Weighted corners. Pinch pleat curtain panel. Polyester. Handcrafted pillows sold individually. Feather filled. Mineral pillow (shown in front), cotton and polyester/cotton; 22"Sq. Made in the USA. Mist blue pillow (shown in middle), cotton and polyester/cotton; 22"Sq. Made in the USA. Fawn pillow (shown in back), polyester/rayon and linen/cotton; 20"Sq. Made in the USA of imported materials. Made in the USA. Handcrafted faux fur (acrylic/polyester) throw blanket. Handcrafted grid pattern pillow. Nocturne Shadow knife edge pillow Handcrafted pillows. Valance in textured scroll medallion pattern. Rose Tree is characterized by ardent attention to detail. Superior workmanship with an air of elegance and refinement. Harrogate collection by Rose Tree. Traditional and timeless design. Introducing Valencia Collection: Jacobean in ivory and black on an ivory ground. Layered with a mini allover ogee design in black and gray with decorative accessories in greys and blacks to compliment it. Curtain panels in allover scroll damask on a fine rib textured ground. Reverses to solid ivory. Norwich collection by Rose Tree. Sophisticated elegance. A classical woven jacquard pattern in a beautiful muted color palate of mushroom and slate greys. Floral curtain panels. Comes with coordinating floral tie backs. 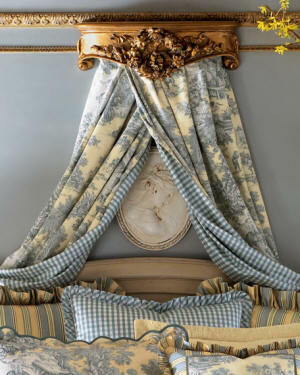 For a timeless look with provincial charm, choose the Jacobean-style floral pattern and beautiful tones of these Valdosta curtain panels from J Queen New York. Bring bold style into any room with the rich tones and classic stripes of these Valdosta window treatments from J Queen New York. Pair the attention-grabbing medallion and striped sheer panels with the elegant damask pattern room darkening panels from the J Queen New York Roosevelt Grommet Curtain Panel Collection Create a chic contemporary look in any space with the bold blocked stripes and refreshing tones of this Freeport curtain panel from J Queen New York. Add a fresh splash of color and contemporary style to your room's decor with the updated floral-paisley pattern of this striking Pristina curtain panel from J Queen New York. Accented with delicate hand smocked detailing and pick stitch pleating with a pleated rod pocket, our curtain panel is a romantic addition to your window. Pretty shades of Slipper Pink, Robin's Egg Blue, Grey, and Ivory Artisanal Collection. These textural curtains are made of the same easy-care fiber as our popular indoor/outdoor pillows and come in lots of colors to brighten any room. Add these tie-top curtains of airy linen gauze to your windows—or around your bed!